The Pips are not coming. But who cares. 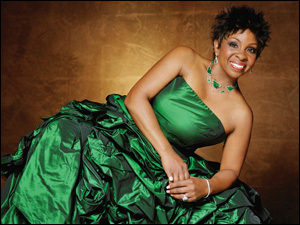 It’s Gladys Knight at the Paramount. What more could you want? One of the most instantly recognizable and loved voices in music. Featuring performances of the classic songs from her latest album, Before Me. Gladys has said, “I love anything that gets me to the people” — and the Paramount is getting her to you! Backed by one of the largest bands to grace our stage. OK. How excited am I? This entry was posted in Paramount Theatre. Bookmark the permalink. I can’t wait for the show. Have my tickets in hand. Been couting the days until the show. It will be fantastic. I want to find you at the theatre so I can say good-bye and good luck. You will be sorely missed. OMG! I just LOVE her!!!! Will there be some sort of meet and greet or will I just have to stalk her on the streets like I did Debbie Reynolds? I heard there was 1 pip there afterall!